Philadelphia is the first city for the MyHeartMap Challenge but will expand to other cities and then the entire US! An AED is a device used to administer an electric shock through the chest wall to the heart. Built-in computers assess the patient's heart rhythm, judge whether defibrillation is needed, and then administer a shock if needed. Audible and/or visual prompts guide the user through the process. Defibrillation was first demonstrated in 1899 by Prevost and Batelli, two physiologists from University of Geneva, Switzerland. They discovered that small electric shocks could induce ventricular fibrillation. The first use of a defibrillator on a human was in 1947 by Claude Beck, professor of surgery at Case Western Reserve University. Beck first used the technique of defibrillation successfully on a 14 year old boy who was being operated on for a congenital chest defect. In the 1960s, portable defibrillators were introduced for use in ambulances. Today, defibrillators are the only proven way to resuscitate a person who has had a cardiac arrest and is still in persistent ventricular fibrillation or ventricular tachycardia at the arrival of rescuers. Sudden cardiac arrest is a major public health problem and affects an estimated 500,000 people every year. Sudden cardiac arrest can strike anyone, so it is extremely important to be prepared to respond quickly to sudden cardiac arrest. Having an accessible Automated External Defibrillator (AED) used to quickly deliver a life-saving shock often means the difference between life and death. When a victim experiences sudden cardiac arrest, with a shockable rhythm, every minute counts; every minute a victim goes without defibrillation, the chances for survival decrease by 7%-10%. But having an AED installed at your location can allow on-site trained responders, or nearby emergency responders, deliver potentially life-saving defibrillation therapy quickly and effectively. AEDs are important because they strengthen the Chain of Survival. They can restore a normal heart rhythm in victims of sudden cardiac arrest. New, portable AEDs enable more people to respond to a medical emergency that requires defibrillation. When a person suffers a sudden cardiac arrest, their chance of survival decreases by 7% to 10% for each minute that passes without defibrillation. AEDs save lives. A microprocessor inside the defibrillator interprets (analyzes) the victim's heart rhythm through adhesive electrodes (some AED models require you to press an ANALYZE button). The computer analyzes the heart rhythm and advises the operator whether a shock is needed. AEDs advise a shock only to ventricular fibrillation and fast ventricular tachycardia. The electric current is delivered through the victim's chest wall through adhesive electrode pads. An AED can check a person's heart rhythm. It can recognize a rhythm that requires a shock. And it can advise the rescuer when a shock is needed. The AED uses voice prompts, lights and text messages to tell the rescuer the steps to take. AEDs are very accurate and easy to use. With a few hours of training, anyone can learn to operate an AED safely. There are many different brands of AEDs, but the same basic steps apply to all of them. 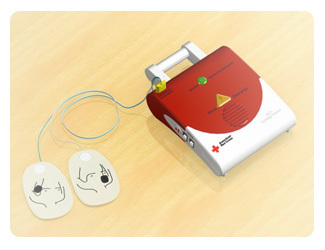 See the illustration below of a Red Cross Training Device, modeled to look and behave like an AED without emitting any shock. Most AEDs are similar in appearance, varying in color and design. Most AEDs are designed for use by non-medical personnel such as police, flight attendants, security guards, and other lay rescuers who have been properly trained. Having more people in the community who can respond to a medical emergency by providing defibrillation will greatly increase sudden cardiac arrest survival rates. Good Samaritan laws provide legal protection for those who provide first aid in good faith and accept no compensation. Tracking the placement of AEDs is critically important and you can help by participating in the MyHeartMap Challenge! View a recent newscast highlighting the importance of tracking AEDs so they can be properly maintained and located during emergency situations.